The viewfinder is an essential part of most cameras for previewing what might be the image after exposure. Only a few camera types are regularly not equipped with viewfinder, for example repro cameras. In digital cameras the viewfinder might be omitted since the LCD display on such a camera's back might serve as provisional viewfinder. It's regularly omitted on big plate cameras which are only used with ground glass focusing/previewing (view cameras). In modern cameras the optical zoom viewfinder is the most important version. This modern variant of the optical viewfinder is used in compact cameras with zoom lens. 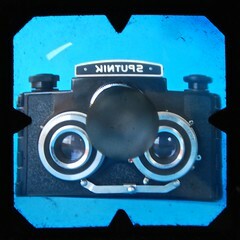 In antique cameras the reflecting type viewfinder is the most common means of image preview. Finders of these types are not always easy to use with precision, but they were cheap, compact and easy to add to a folding camera's front standard or folding bed, or into the housing of a box camera. The view in them is reversed left-to-right. The brilliant finder is the most widespread of such finders, a combination of a lens, a mirror at a 45 degree angle behind that lens, and another lens at right angle position to the first one to view the mirrored image from the top. Brilliant finders are usually very small - perhaps 1 - 2 cm across - but exceptions exist. 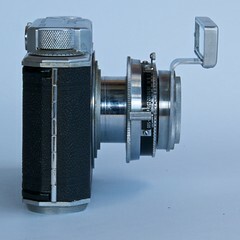 The Ensign Ful-Vue box camera (pictured below) has what is optically a brillliant finder on the top, but this is sufficiently large as to give the impression of a twin-lens reflex camera (such cameras are sometimes called 'pseudo-TLRs'). 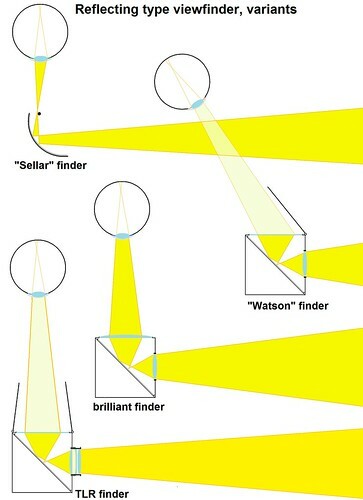 An older version is the small cubic Watson finder with lens and mirror as in the brilliant finder, but with a matte screen for viewing the finder image, sometimes hooded. A special version was the Sellar finder which consisted just of a concave mirror (which gives a reflected view reduced in size so that only a small mirror is needed) with targeting aid, to help the user position their eye to give the correct view. 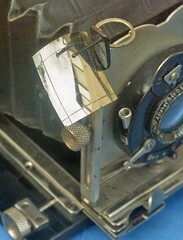 The mirrors used in these simple reflective viewfinders are frequently not glass but polished metal, especially in cheaper cameras. This tends to give a less clear reflected view, but has the advantage that the mirrored surface has in many cases not degraded after many years, in contrast to most old SLR mirrors (below). finder, not a frame, for eye-level use. In reflex cameras (both twin-lens and single-lens reflex), a mirror is used to reflect the light from a lens onto a horizontal ground-glass focusing screen at the top of the camera. 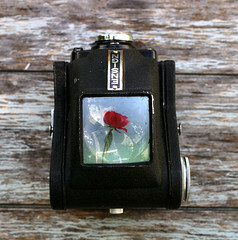 The only difference between SLR and TLR arrangements is that in the SLR camera, the mirror is moved immediately before exposure, to allow the light to be focussed onto the film, plate or sensor instead, while in a TLR camera the mirror and focussing screen are permanently arranged as a viewfinder, and the photograph is made with a separate lens, focused in synchrony with the viewfinder's. The simplest use of such a focusing screen is to view it from above, usually with the aid of a hood to exclude ambient light so that the focused image seems relatively bright in the darkness of the hood. This arrangement is usually called a 'waist-level' finder (WLF), though it is frequently used at chest level or close to the eye (with a loupe), and is especially useful when the camera is to be used at very low level on a tripod, where an 'eye-level' finder would be useless. The waist-level finder has been an extremely successful design, being in production by numerous makers for more than a century. Like the simpler reflex finders (above) the view in these finders is reversed left-to-right. Some find this very difficult, especially if also using other cameras that present a normal image, but the difficulty is reduced with experience. This feature is not particularly important with some genres of photography (landscape, especially), but might greatly interfere with photography of fast-moving scenes, or informal photography of people (a wedding reception, say). Cameras may be provided with a simple frame finder for such situations. (i) Many waist-level finders are equipped with a loupe or magnifier, to allow more exact focusing. Typically this is attached on a hinge, and folds away in the hood when not in use; in more modern cameras it is often self-erecting with a spring. In some cases (as in the Pilot Super) the frame of the loupe covers the whole hood when erected, further darkening the hood. (ii) A fresnel lens is often placed on top of the focusing screen, to improve viewing of the periphery of the image. The ground-glass screen diffuses the focused image; the majority of the emergent light from the centre of the screen is directed upward, so this part of the screen is easily viewed. However, without a fresnel screen, the corners of the screen are often dark. (iii) The WLF in some cameras such as the Lubitel TLRs, and the stereo Sputnik (pictured left) are provided with a condenser lens instead of a fresnel, of which only a small area is ground as a focusing 'spot'. This gives a bright, 'aerial' image which is excellent for framing, but focusing can only be done in the small ground-glass area. This viewfinder is essentially a combination brilliant finder and focusing WLF. (iv) In recent years, specialist companies have offered finer grades of ground glass and polymer screens, to improve WLFs beyond the performance of their manufacturers' screens. 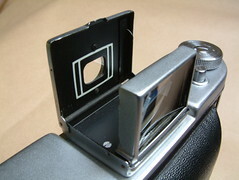 (v) The hoods of many small WLFs (up to medium format) can be folded to form an eye-level frame finder (see below). Many older cameras have some arrangement of rectangular frames to show the approximate image frame. This might consist of two frames, or one frame with or without crosshairs plus a targeting aid. Some box cameras (for example the Ensign Box 2¼ B) had just a single wire frame at the front, with no rear component at all. A big rectangular frame, often of wire, combined with a targeting aid is called a sports finder - following fast action is comparatively easy with this type of finder, where the image is seen at correct scale, correctly oriented, and there is usually some visibility around the edge of the frame. At least as recently as the late 1990s, high-end medium-format cameras were provided with 'sports finders' integrated into the waist-level finder, and a plastic variant of the sports finder can be bought as accessory for modern underwater cameras. 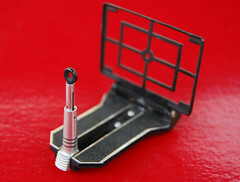 A development of the frame finder was the Newton finder, with a single, plano-concave (negative power) lens in the front frame, and a targeting aid near the user's eye. The negative lens gives a reduced-size view of the scene, allowing the front frame to be smaller. Some might also find the smaller image easier to view. A disadvantage of this simple design, however, is that users with long sight (hyperopia) might struggle to view the scene clearly through the finder's negative lens. Other optical viewfinders of old cameras are placed upon the camera top as a small rectangular "telescope". Optically, these finders comprise a negative (plano-concave) lens at the front, and a positive lens as the eyepiece (addressing the disadvantage of the Newton's finder above). Galileo designed a telescope using the same optical arrangement as this finder, in reverse. These finders are therefore sometimes called the reverse Galilean type. Like the Newton finder, they give an image of reduced size. Reverse Galilean finders are often found as just a pair of lenses in collapsible frames (not enclosed in a tube) on older cameras, especially folding ones. In cameras made since the 1950s though, these viewfinders are more often integrated into the camera top housing. Combining a 'rangefinder spot' into a telescopic viewfinder has been common since the mid-1950s. In some reverse Galilean finders, the rear face of the front lens is half-silvered, to reflect an image of a set of frame-lines, painted on the surround of the eyepiece lens. The user sees the framelines superimposed upon the scene. This type is known as an Albada viewfinder (after the Dutch military officer and optical designer Lieuwe Evert Willem van Albada, who invented this and other optical systems). In the Albada finder pictured to the right, both faces of the front lens are concave; the curvature of the rear face is determined by the need to reflect the framelines at the correct scale; the front face is curved so that the scene appears at the correct scale. This method worked less well when viewfinders began to be fully enclosed (the Pax Jr has an enclosed Albada finder, which is very large, perhaps in order to admit enough light to illuminate the framelines). Bright frame (or brightline) finders (below) were the solution to this problem. In many cameras, a bright frame is shown in a telescopic viewfinder by placing a half-silvered mirror in the finder, at an angle to reflect frame lines at the side, which are illuminated by light from a translucent panel on the camera front, next to the viewfinder. Correction of Parallax error with telescopic viewfinders has been attempted in several ways. Perhaps the simplest is an alternative set of framelines in a brightline finder, to be used for close focus; Less commonly (often seen on Balda cameras), the angle of a telescopic finder may be adjustable for close focusing, as pictured right. Accessory Auto-Up devices, which comprise a close-up lens, plus a prism to offset the view of the rangefinder/viewfinder downward, were available (for example that mounted on the Konica pictured right). Modern telescopic finders are often rather sophisticated, incorporating a zoom element to reflect this capability on the camera. Since 1960 it has become increasingly common to present exposure information in the viewfinder. Several kinds of indicators have been developed. The first were red/green indicators for correct- or under-exposure, in the early cameras with selenium-meter controlled exposure. Nowadays a green LED is standard that's on when the autofocus finished focusing. Other information might be mirrored into the viewfinder or shown in an LCD section in the frame around the viewfinder image. 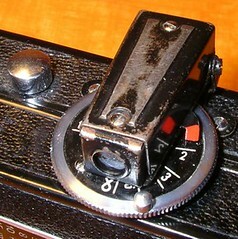 In the 1970s and 80s a row of LEDs beside the finder image was common as scale showing the (proposed) shutter speed or a match-needle metering instrument replacement. Finders of modern SLR cameras view through the taking lens and are completed with a pentaprism plus ocular or a mirror system plus ocular. With these additions the reflex finders become eye-level finders and enable the photographer to see the image like through a telescopic optical viewfinder, including any effects introduced by the lens itself or added to the lens. 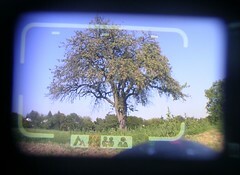 A new type of the viewfinder is a combination of a miniature color LCD screen with an ocular lens. It's often found in compact digital cameras with a very wide zoom range. Of course the inventiveness of camera developers didn't stop with the question "How can we combine the advantages of waist-level and eye-level in one finder?". One answer was a collapsible hybrid viewfinder. It had a front lens with crosshairs as a targeting aid, what was called Newton finder 100 years ago. With this combination it was an eye level finder. But when its crosshaired mirror was put in at a 45 degree position behind the lens it became a smart waist level finder. Smart because the crosshairs of the lens and that on the mirror helped to find the perfect perpendicular viewing position of the eye over the finder. A newer type of hybrid finder was introduced by Fujifilm at the Photokina of 2010: A combination of optical telescopic viewfinder and electronic finder, made visible thru one ocular. This page was last edited on 26 March 2018, at 08:11.